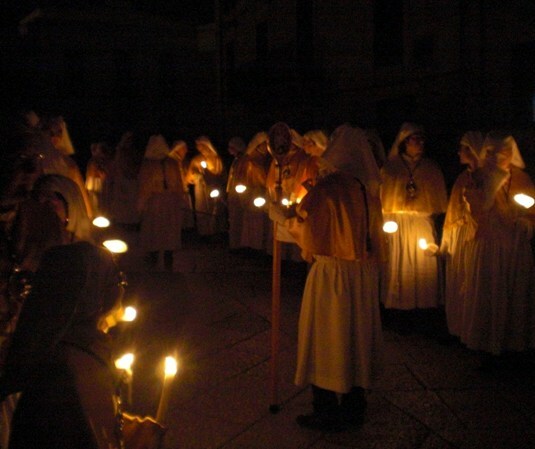 Easter is not a single day of celebration in Italy, but a season of intensely felt religious tradition. In this Catholic nation, the build up to the Easter weekend is quite solemn and encompasses the period of Lent, which begins 40 days before Easter. The entire week before Easter is called Holy Week and during these seven days the passion, death and resurrection of Jesus Christ are celebrated in a series of religious events. 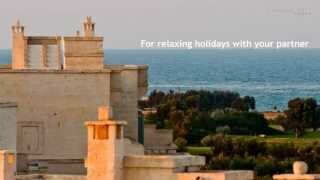 Each town has its own traditions, let's take a look at those of the small, seaside city of Molfetta. 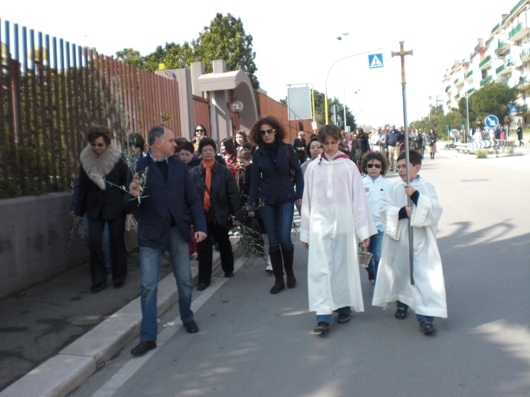 The Sunday preceding Easter is Palm Sunday, on this day olive branches, a symbol of peace, are blessed by local priests and carried in processions through the towns. These branches are taken home and should be kept in the home to remind families of the message of peace throughout the year. After dark on Holy Tuesday, a theatrical representation of the Passion of Christ is acted out in the streets of the old town, which dates back over 1,000 years. It is a traveling show, with each scene being performed in a different corner of the historical center which is shaped like a fish's spine and surrounded by ancient town walls. Equal attention is paid to the dramatization of the last supper, Christ's trial and crucifixion and the audience travels as a group from set to set accompanied by a live band playing the city's renowned funeral marches from the 1800s. 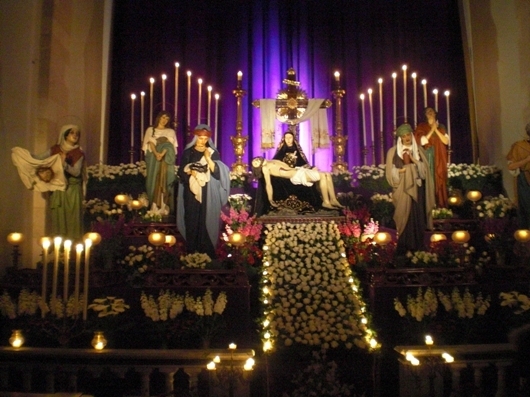 On the evening of Holy Thursday the whole town turns out to visit the “sepolcri,” which are artistic displays of offerings of bread, wheat, eggs, flowers, candles and lights in each of the city's churches. The tradition requires that you visit an odd number of churches. People willingly wait up to an hour in line to file past these displays and pay their respects. 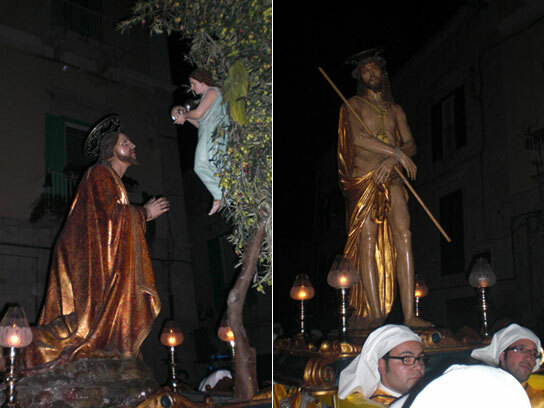 The most evocative of the many processions that are held during Holy Week in Molfetta is that of the Sacred Mysteries, or the Stations of the Cross. 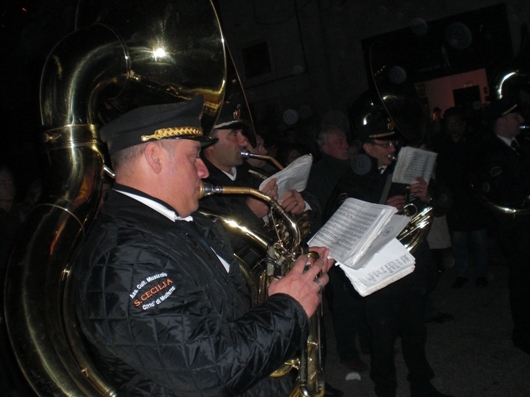 This procession is held at 3:30 a.m. In the dark of the night, a series of life-sized five statues exit the Church of Saint Stephen lit only by long candles carried by groups of religious fraternities. Each group is responsible for carrying one of the statues: Christ in the Garden, Christ at the Column, Christ with the Crown of Thorns, Christ at the Calvary and the Dead Christ. Total silence reigns among both the participants in the procession and the crowds of spectators, the only noise being the mournful music of the funeral marches played by the town band. While Holy Week is very solemn, Easter Sunday is a time for celebrating the Resurrection of Christ and the churches are normally full and beautifully decorated for the occasion. After church, the celebrations really begin and as always food plays a large part! 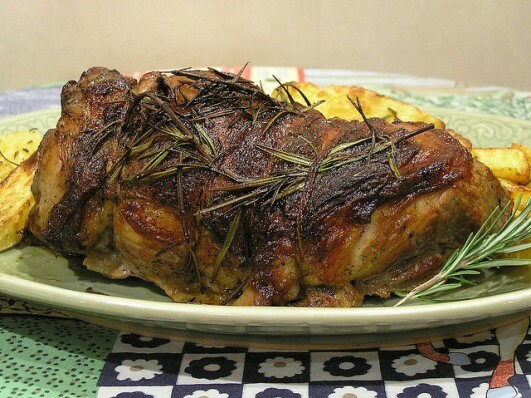 A traditional Easter meal in Puglia will almost certainly include lamb which is often roasted. This tradition has been passed into the Christian celebrations from Pagan times when lambs were always sacrificed to begin a feast. 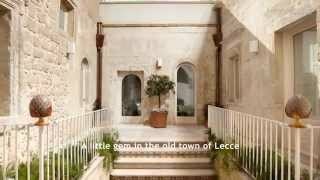 In the region of Bari, if the lamb isn't roasted, then it would most likely be served as Verdetto, a sort of lamb stew cooked with peas or fresh green asparagus or young, tender cardoons. 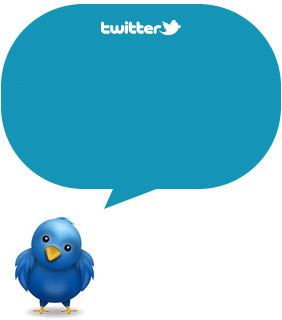 The vegetable used depends what is in season when the Easter Holiday falls. Following the traditional Easter Sunday dinner, the parties usually begin. If the weather is good, many families and friends descend on the beaches or congregate at each others houses and as Easter Monday is a bank holiday more parties and excursions are arranged. To most Italians, Easter is the real beginning of Spring and Summer and the most important holiday weekend of the year. If you are planning to eat out, it would definitely be advisable to book well in advance.